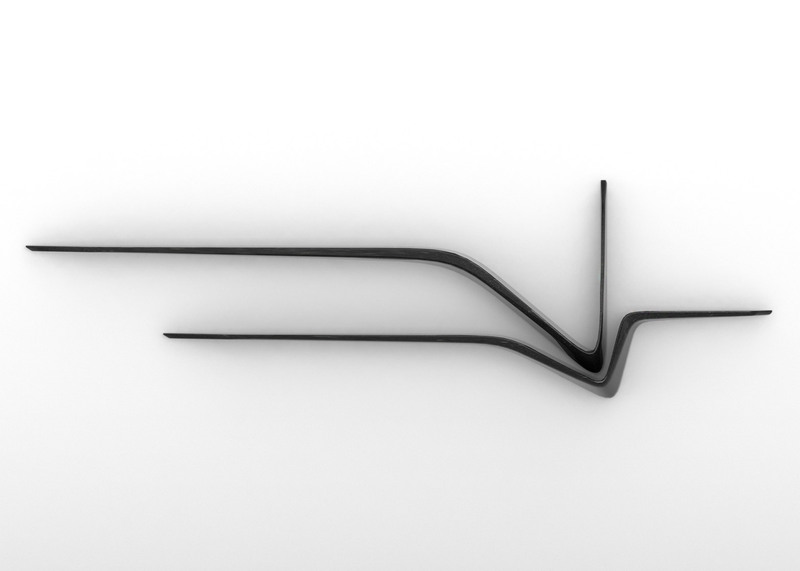 Milan 2016: curving lines of black granite form this shelving system by Zaha Hadid, unveiled in Milan by Italian brand Citco a month after the Pritzker Prize-winning architect died unexpectedly (+ slideshow). 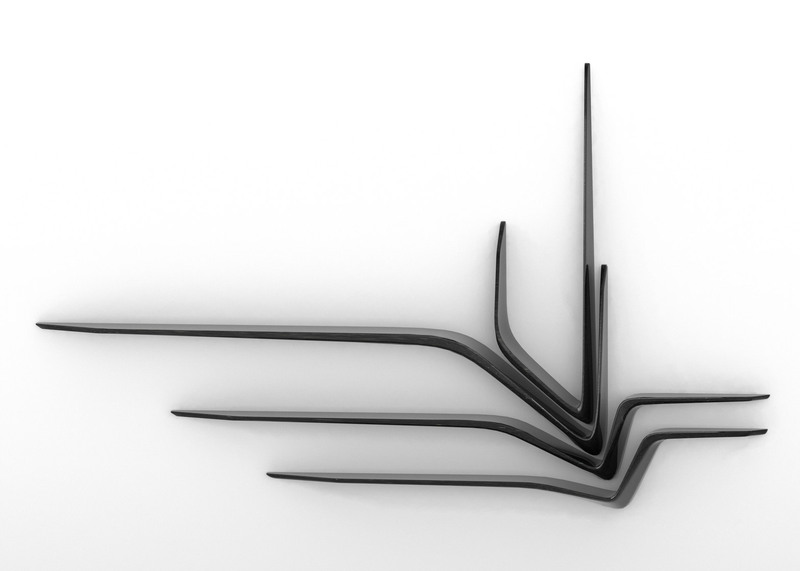 Zaha Hadid designed four Valle shelves for the Italian company, each of which can be mounted on the wall as a single piece or positioned together to form a unified configuration. 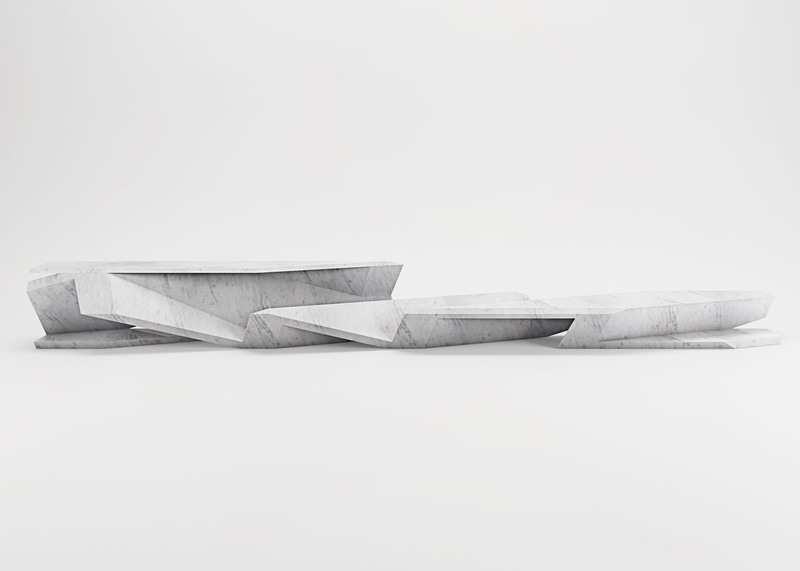 "Valle is a shelving system finely crafted in black granite that continues my explorations with Citco into the unique properties and performance of stone," said Hadid prior to her death. "[The shelving system] is defined by the contrasting lightness of its design with the solidity of black granite." 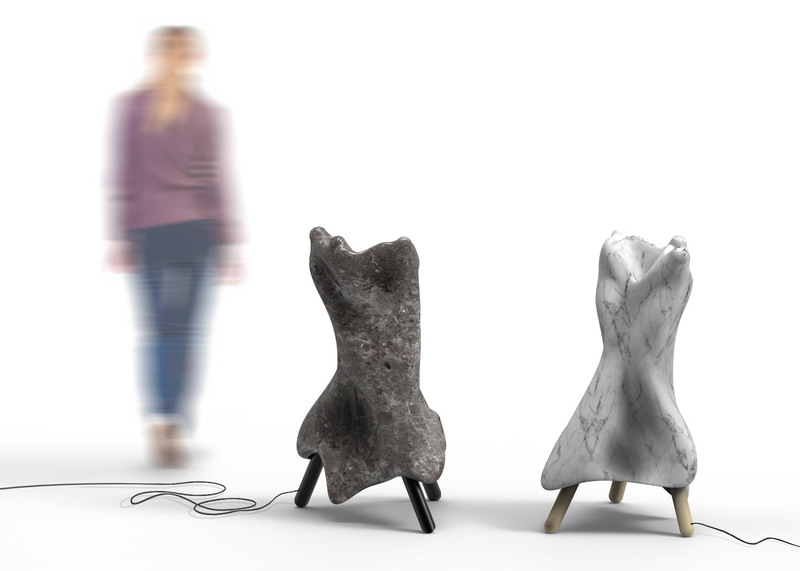 Each piece appears to slot into each other, creating a form influenced by "the beauty of nature and the power of geology". 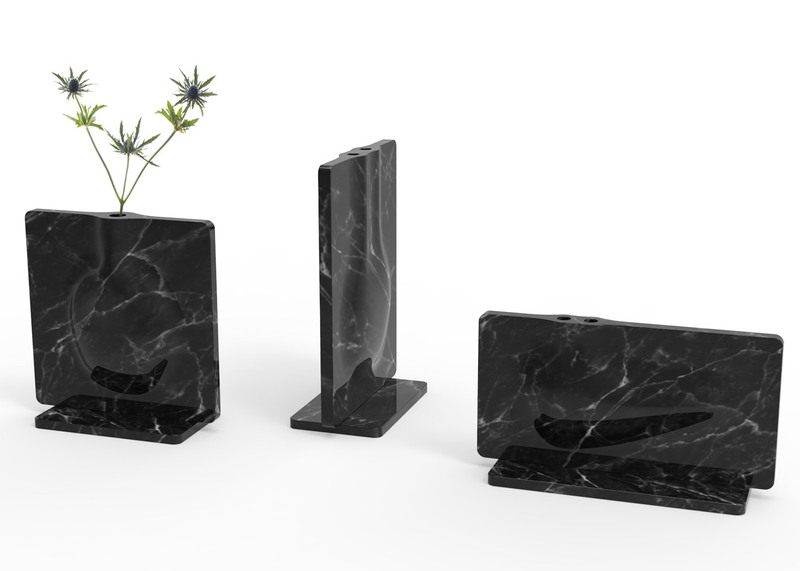 Citco worked exclusively with Hadid for three years, leading to the creation of marble vases and tables, and cantilevered granite shelving forms. But the brand has now announced a roster of new collaborations with high-profile designers and architects. Among them is architect Daniel Libeskind, who has created a long and geometric table that incorporates a shelving system for the brand. 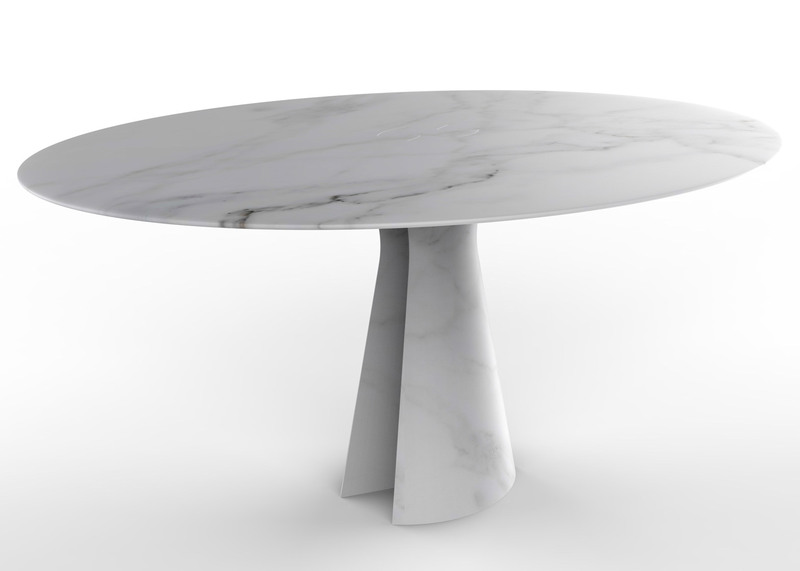 The Enigma table's sculptural form is created from a block of white marble using precision-cutting technologies. "The Enigma table illustrates deft control of bold, complex geometric forms and continues the exploration of sculptural furniture for home and office," said Libeskind. "It is carved in Carrara white marble in a three-dimensional matrix using cutting-edge technologies." 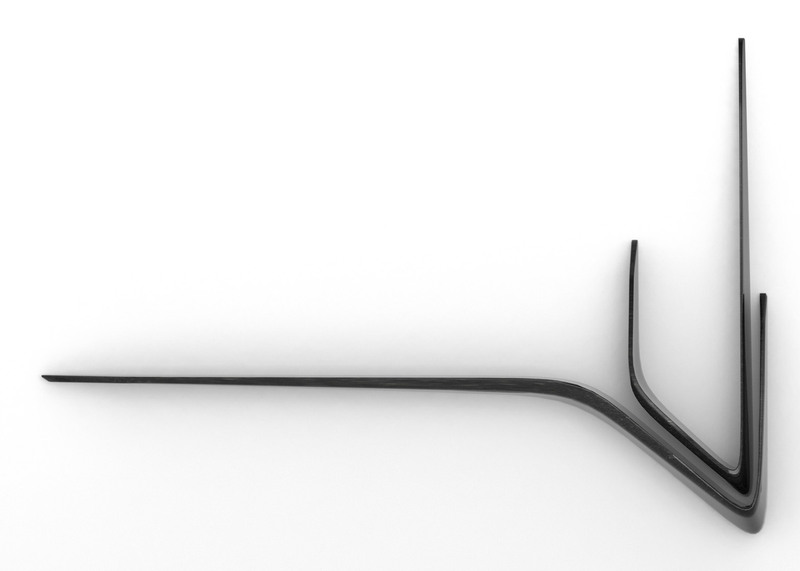 The shelving system slices down and away from the tabletop, reaching out beyond the length of the surface in a jagged series of angled juts. "The shelving system presents the intertwined stories that seem to open up and relax in a dynamic gesture that follows a parallel trajectory," explained Libeskind. "The result is an extruded form, similar to puzzle surfaces and voids, that is highly functional and sculptural at the same time." British architect Norman Foster has created two tables for the Italian brand, each designed to symbolise feminine and masculine forms. 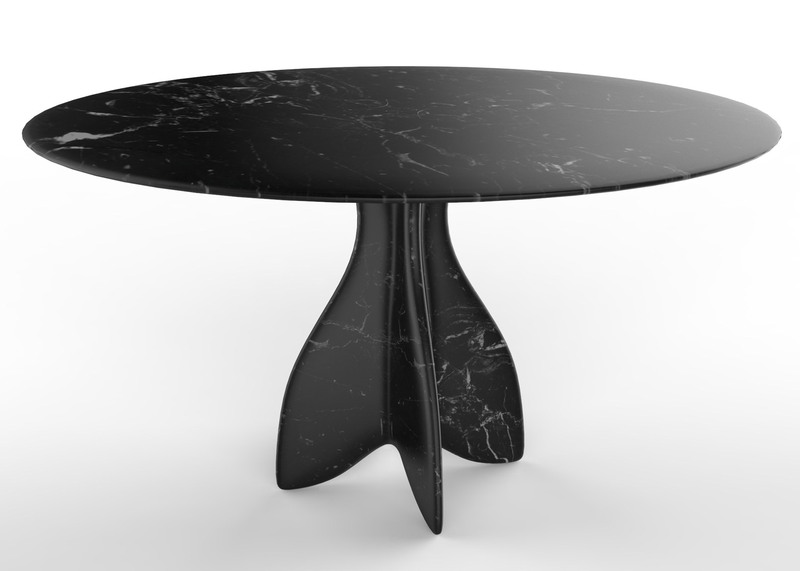 Both tables comprise a polished marble top with a support made from the same material. The Hadriana table incorporates a cruciform central support that is wider at its base. The support narrows before widening again slightly where it meets the tabletop. In contrast, the Hadrian table features a rounded base that narrows gradually as it reaches the tabletop. "The materiality of stone embodies the seemingly opposing spirits of both permanence and ductility – of structure and sculpture," said Foster. 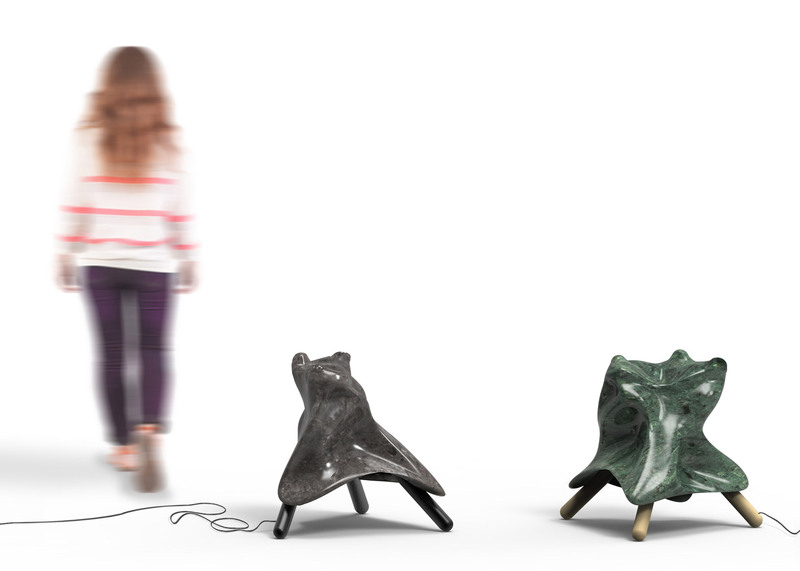 Industrial designer Arik Levy designed two products – OrganVase and Splash – for the collection. 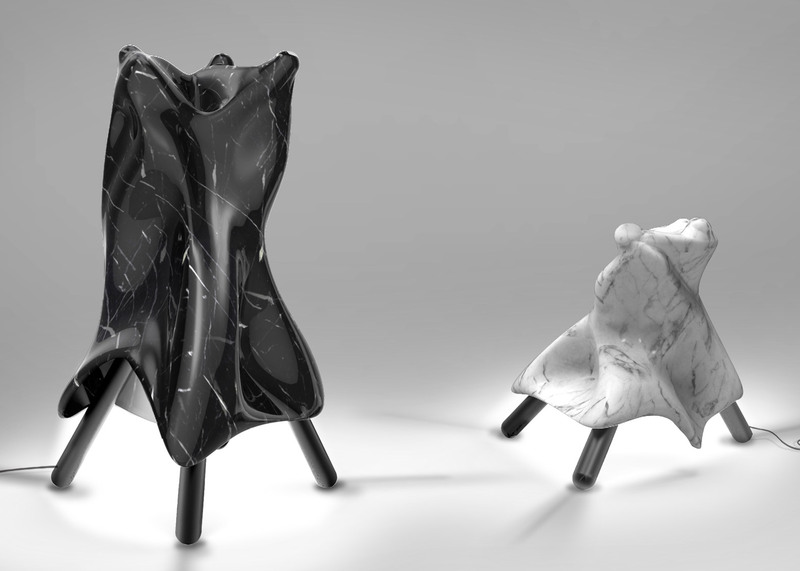 The Splash lamp was designed by Levy to give the appearance that the marble is fluid. 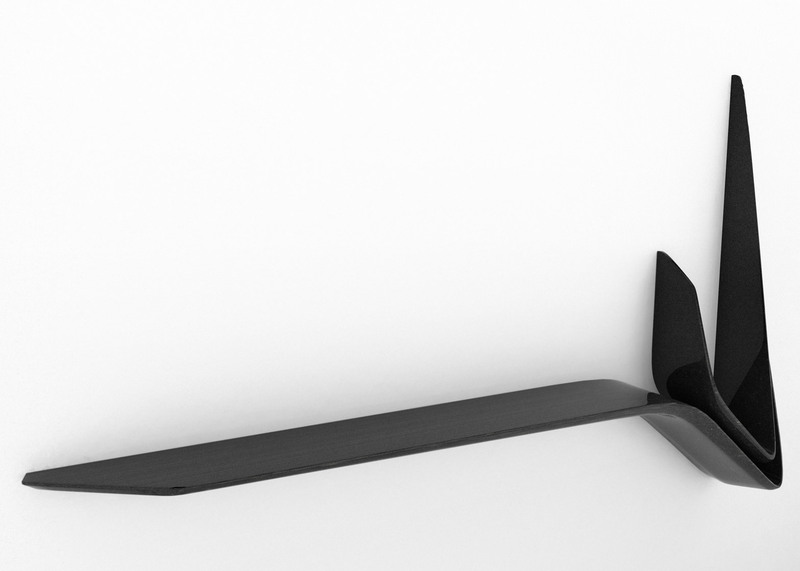 The main body of Splash sits on four brass legs. "My idea was to make marble look and feel flexible and fluid, create the sensation that it is melting before our very eyes," said Levy. "Like the waves of the ocean splashing over rocks, my marble Splash evokes this moment of dynamic movement and elasticity." 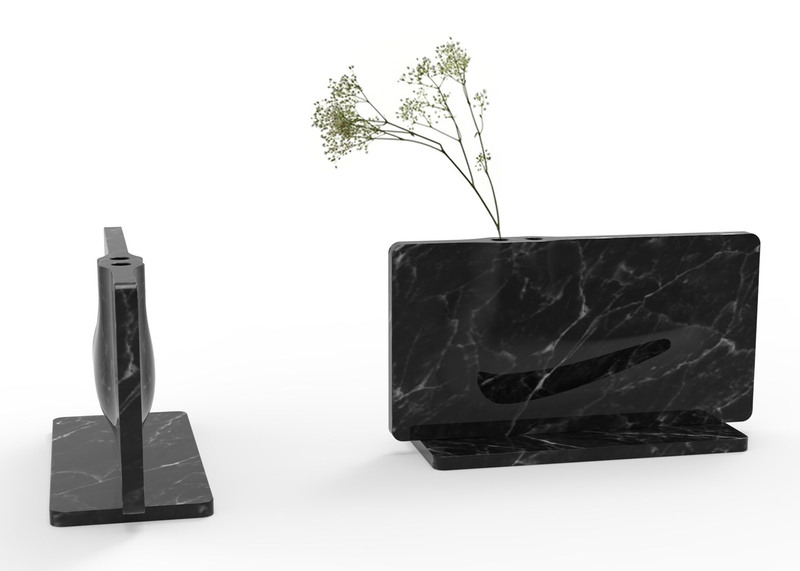 The OrganVase collection aims to make marble appear "as slender and as light as paper". A rectangular base provides support to a curved yet slim slab of the material, where holes have been cut to hold flowers. Completing the range, Italian design Ferruccio Laviani produced two table lamps called Totem that is available in a range of colours. "I wanted to create an object that was more like a presence, a table sculpture, reminiscent of Brancusi with an abstract and anthropomorphic shape, but useful at the same time, not just beautiful," explained Laviani. Citco is presenting the range at the Salone del Mobile furniture fair in Milan from 12 to 17 April 2016. 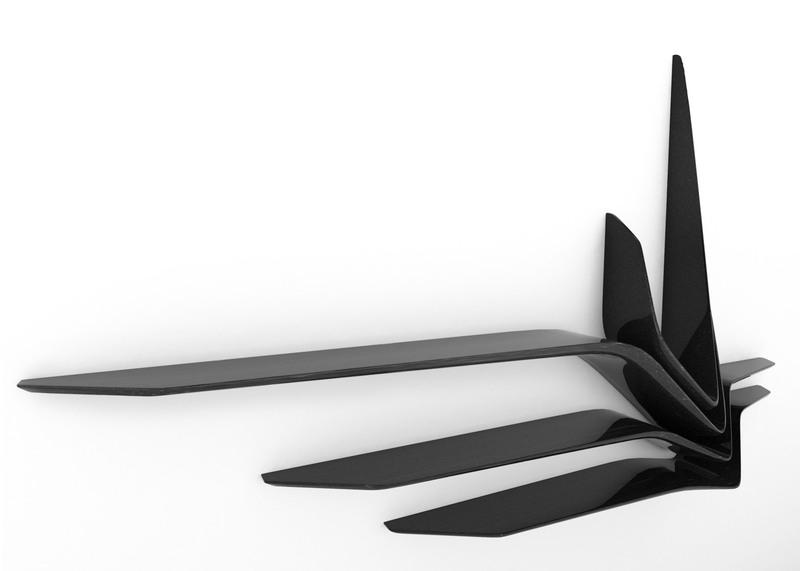 Other products launching at the event include Hadid's Mew table for Sawaya & Moroni – her last piece of furniture design.